Mark your calendars for May 8! We will have more details soon for the spring career event. Visit with local, regional, and national organizations that want to put your creative knowledge and talents to work. Registration for organizations wishing to attend will be available in December. 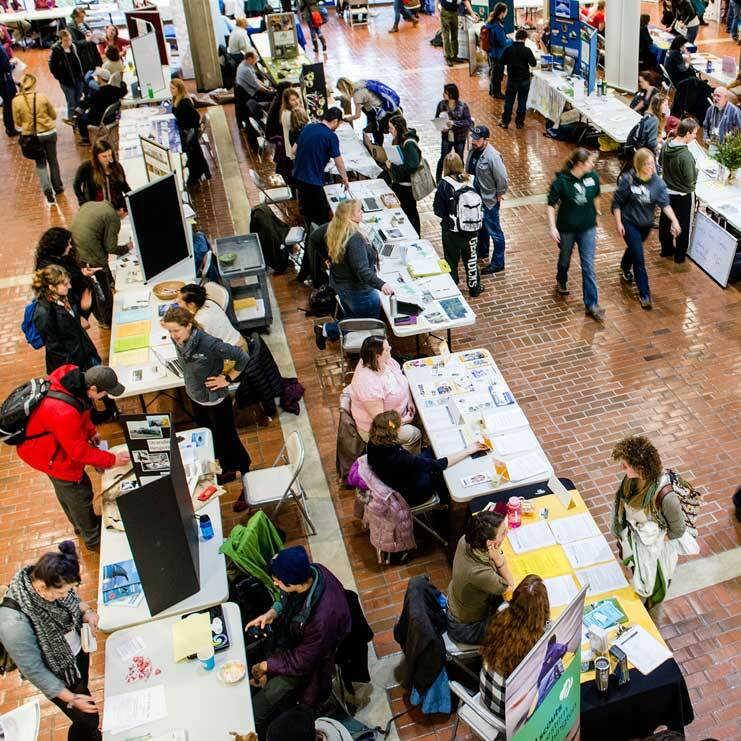 For more information about this year's (2019) past event visit the Community Opportunities & Internship Fair webpage. Last fall's event was on October 17 and was a great opportunity to visit with graduate school representatives and make plans to reach your educational goals. Check out the list of schools who to attended the fair last year. Graduate schools interested in registering for this event next year (2019) should contact Katherine McGee at mcgeek@evergreen.edu or call (360) 867-6395. Learn how to plan for Evergreen's MiT program and Washington State teaching endorsement and certification requirements. Please read the MiT catalog and complete an appropriate endorsement worksheet to the best of your ability before this meeting. Bring your transcripts with credit equivalencies, if possible. For more information call 360.867.6559 or visit the website: www.evergreen.edu/mit. ​Peace Corps Recruiter Tamorie Mayweather will be on campus Thursday, April 18th to provide the Evergreen community with resources and information about Peace Corps service. This is a great opportunity for students to learn more about their options in the Peace Corps, to ask questions about benefits and the application process, and to connect with a recruiter for the inside scoop on getting an invitation to serve in one of 60 different countries around the world for 27 months after college. If you are interested in reaching out to learn more about the Peace Corps, Tamorie may be contacted at tmayweather@peacecorps.gov. Find out about study at universities abroad, options for study abroad programs, and planning for independent study through individual contracts when you attend a Study Abroad Workshop. Also check out the Study Abroad web-site for more information. The Washington State Legislative Internship Program offers Washington college students the opportunity to gain paid work experience while studying the state legislative process and learning about public policy up close. During the internship, which takes place in 2019 in the winter and spring quarters, interns work for members of the Washington State House of Representatives or Senate and with legislative staff while earning academic credit from Evergreen.